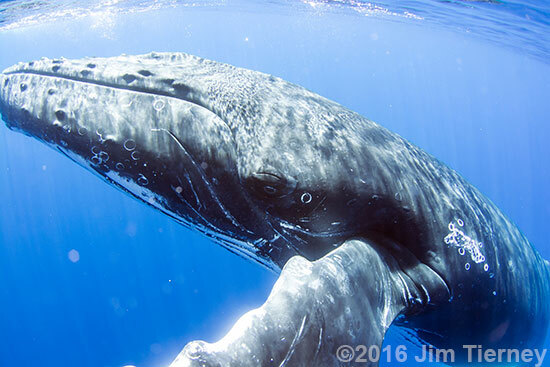 I’ve spent the last 7 years going out to Maui during the winter to photograph whales. Hawaii is the migration destination of the North Pacific Humpback Whales. Over the course of four months, it’s estimated that about 12,000 whales migrate from Alaska to Hawaii. 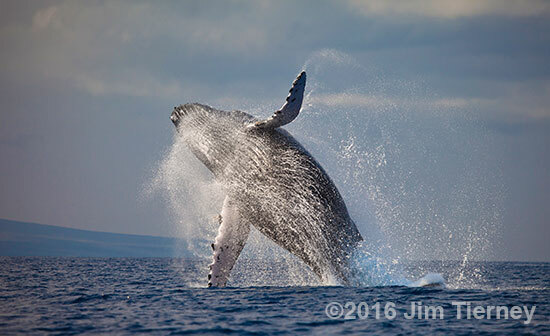 During the peak months Jan 15 – March 15th or so, there’s probably about 6000+ whales around Hawaii. This creates a really awesome opportunity to photograph them as they are EVERYWHERE. 1- Patience: Most of the time the whales are below the water surface and out of range of an underwater camera. There’s a lot of ‘whale waiting’ going on. 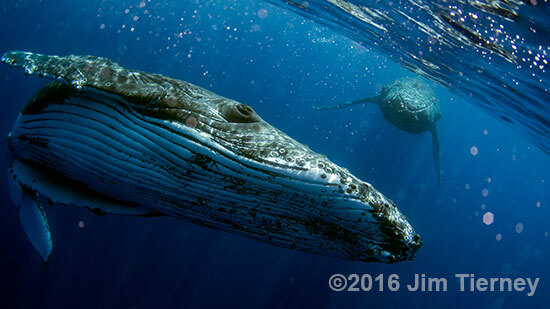 It may take quite a few trips before a whale gets close enough to shoot underwater. To capture the above the water activity you really need to pay attention. Frequently it happens very quickly and is over before you can even get your camera up if you’re distracted by talking or looking at photos on your camera. Stay present and focused. 2- Aperture Priority mode: Both above and below the water I set the camera to Aperture Priority and set the lowest aperture I can, getting it as wide open as possible. You want as fast of a shutter speed as possible (for 50 ton animals they can move FAST!) and setting it to the widest aperture will do that. You also want that nice depth of field a low fstop will give you. 3- AutoFocus: You have to have autofocus turned on. The action happens to fast to manually focus. Also, use AF points that are calculated in both the horizontal and vertical axes. Not all AF points are created the same. 4- Lenses: For above the water, the 100mm-400mm is a good lens for the distance the boats usually tend to stay from the whales. It’s not great if the whales come right up to the boat… but that’ s when you bust out your underwater camera with a very wide angle or fisheye lens. 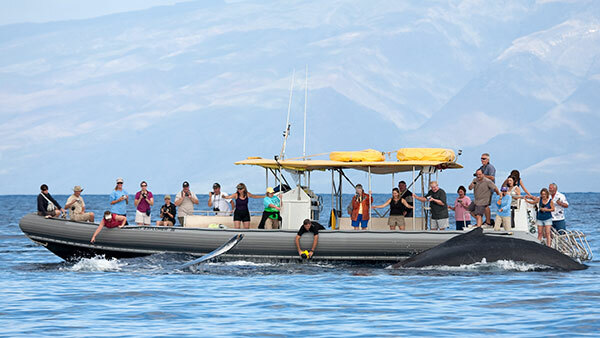 With underwater photography, at least in Maui, you can only photograph the whales if they come close to the boat. You’re not going to be able to operate a zoom lens hanging over the side of a boat. So set a pretty wide focal length when you put it into the housing. I’ve got a 12-17mm Tokina fisheye and usually set it to about 14mm. This means the whale has to be within about 10 feet of the boat to get a good shot. But due to underwater visibility, that’s pretty much the case no matter what lens you have on the camera. 5- Burst Shooting: Make sure you set the camera to burst mode. The more photos the camera can take when you press and hold the shutter button the better. Many whale watches will mostly be comprised of ‘whale waiting’. But if you stay present and your gear is set up correctly, you’ll be in great shape to capture those moments when you’re almost touched by a whale!